Sad news. 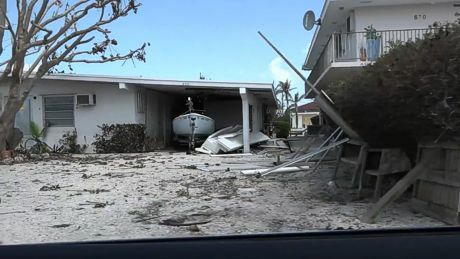 My little home city in the Florida Keys has a lot of damage from Hurricane Irma and I need to head south. My plan is to get started reconstructing my own home and to help my neighbors who are already there. Northwestern Medical Center up here has donated masks and surgical gloves that we will truck south. A lot of work has already gotten done. Water and sewer are operational. Electricity is on most of the time. Cell service mostly works. The Internet is mostly still down. As of the 5 p.m. advisory, Irma is about 96 miles ever so slightly east of due south of KCB with 125 mph winds gusting to 155 and still moving the west-northwest at 9 mph. The core of Irma will continue to move near the north coast of Cuba during the next few hours and restrengthen once it moves away from Cuba before reaching the Keys Sunday morning. Storm surge from Card Sound Bridge through Cape Sable, including the Keys is still forecast at 5-10 ft along with 10-20 inches of rain and as much as 25 inches in some isolated spots. The GOES-16 satellite showed the eye went over Big Pine at Cat 4 strength about 9 a.m. That puts Marathon and South Puffin close to the eyewall. I think that means 120-ish mph winds with gusts to 140 in South Puffin [an anemometer there read 160 mph before it got knocked down]. At 10 a.m., it was at 84N 81.5W which is about 25 miles northeast of Key West, 25 miles northwest of KCB, and picking up speed to 8 mph. There was a 2′ surge reported in KW then as well as 120 mph gusts in Big Pine and 106 mph at Key Deer Refuge. The “LIVE Marathon Florida Cam” is down. Initial landfall took place at Cudjoe Key at 9:10 am. EDT on September 10 with an estimated 10 foot storm surge in the afternoon. Today would have been my dad’s 98th birthday. Hurricane Donna came through the Keys on this date in 1960. Surge and power failure are still my primary worries, especially since the power seems to be out. My frig and Joe’s two YUGE, full-size, chock-a-block-full bait freezers and Ed’s three freezers are gonna smell really, really wonnerful. Onshore winds for quite a while and the surge started building as the tide came in. Water was over the docks in South Puffin at 11:10 a.m. THE KEYS ARE CLOSED TO RETURNING RESIDENTS. Early reports had 2-1/2 feet of water on 11th Street. That’s as much as knee high in the house. If that’s accurate, I figure carpets, the interior paneled walls, the tools and hardware, electronics, furniture, and all the beautiful new kitchen cabinets. Get your FEMA paperwork ASAP. 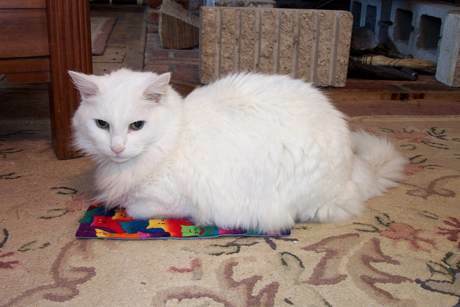 Trouble is, we’re not there to assess the damage. From John Bartus: Keys are in what can be called a “humanitarian crisis” right now. There is limited water (no water in many areas), no power, no communication at all, and the people who stayed behind need help. 100 yards of US 1 near Sea Oats Beach on Lower Matecumbe were washed out. The first responders and crews on the scene are adamant that the Keys cannot handle any more people until they can assist the ones who are there and in need. Absolutely nothing I can do. Nada. Zero. De zip. I couldn’t get there even if I could fly down today. 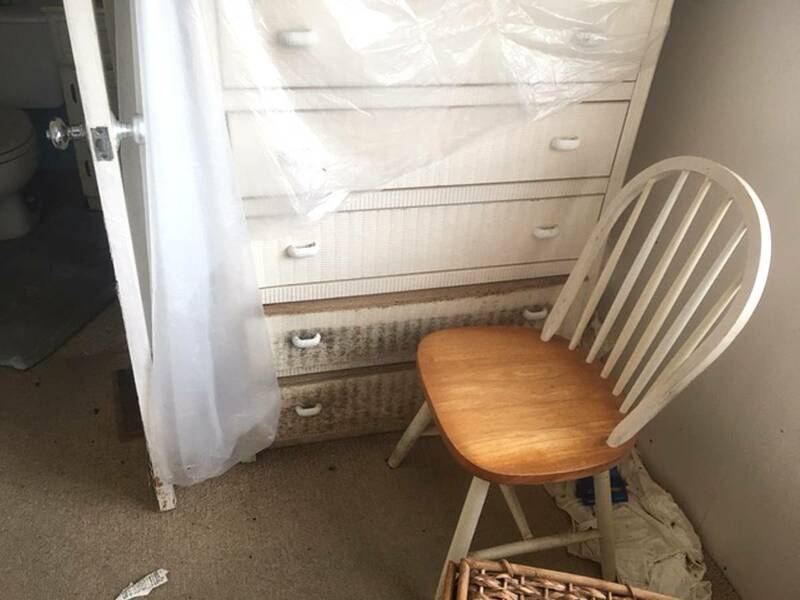 There will be mold. I know a lot so far, some from the news and most from people on FB, but very little about the facts on the ground. The Keys are closed. There’s no power, water, or cell service and there is a roadblock turning away traffic. Marathon got moderately hammered but I’m hearing everything from 1 inch to 2-1/2 feet of water in some houses in South Puffin. The real problem is lack of data. I’m pretty sure the building wasn’t damaged but I don’t know how hard the wind hit. I don’t know if the water rose above the yard. I don’t know if water rise lifted Joe’s boat and his boatlift out of the ground. I don’t know what happened in my carport. I don’t know if the roof held. From Mayor John DeNeale: SUNSET TO SUNRISE CURFEW IN THE KEYS. The Wednesday Budget Public Hearing will be continued for a week. There is a rumor that the Keys are being evacuated of all people. This is false. We are still on the plan to get first responders, disaster crews and supplies in. People that want to leave can, they will not be stopped at road construction sites. 1. A working Sewer: Dave Evans is working on the plant. 2. FKAA water even if not potable (boil water required) and for fighting fires. 5. Roads that are well cleared to handle civilian cars. The Sheriff reports that all emergency vehicles are fixing many flat tires as a result of debris on the roads. The road at MM 75 is still not repaired; it will be temporarily repaired with crushed recycled asphalt for a while. 6. Food. Our city people in KCB are going to the EOC for food and water. 7. A hospital. There are currently no hospitals capable of supporting residents. 8. Basic communications. There is no reliable cell capability south of Key Largo and none south of Islamorada. A second check point has been set up in Islamorada at the Midway Cafe to keep people out. The Alaska National Guard has set up in the Winn-Dixie at Big Pine Key. Florida Keys Aqueduct Authority will have water available for Key West from 10 a.m. to noon today. Marathon airport is accommodating emergency flights. The Key West airport and Boca Chica Naval Air Station should receive flights later today. US1 Radio broadcast information right through the storm and has stayed on air. I talked to Joe this morning. His boat, not at the dock in the NOAA photo, is in the barn at Driftwood Marina getting new fuel tanks. 311 10th Street maybe lost all its roof covering but its partywall neighbor at 301 is fine. 410 10th Street lost some roof covering, right down to the plywood. 610 11th Street, four houses from mine, lost a lot of roof covering, right down to the plywood. Its boat looks like it is turned around and up on the seawall. 181 9th Street, the house with the tower, and its partywall neighbor at 191 lost some roof covering, right down to the plywood. 220 9th Street which looked like a BUR already short of some gravel like mine lost some roof covering, right down to the pine boards. 290 and 300 9th Street got scraped but it looks like tar paper is left. 381 9th Street lost looks like most of its roof covering down to the boards but its partywall neighbor at 391 is lost only a little at the peak. 451 9th Street lost some roof covering, right down to the pine boards. 521 9th Street lost some roof covering, down to the tar paper. 670 9th Street is new construction, I think, and lost an entire roof. 1000 W. Ocean lost some roof covering, right down to the plywood, on the main roof. 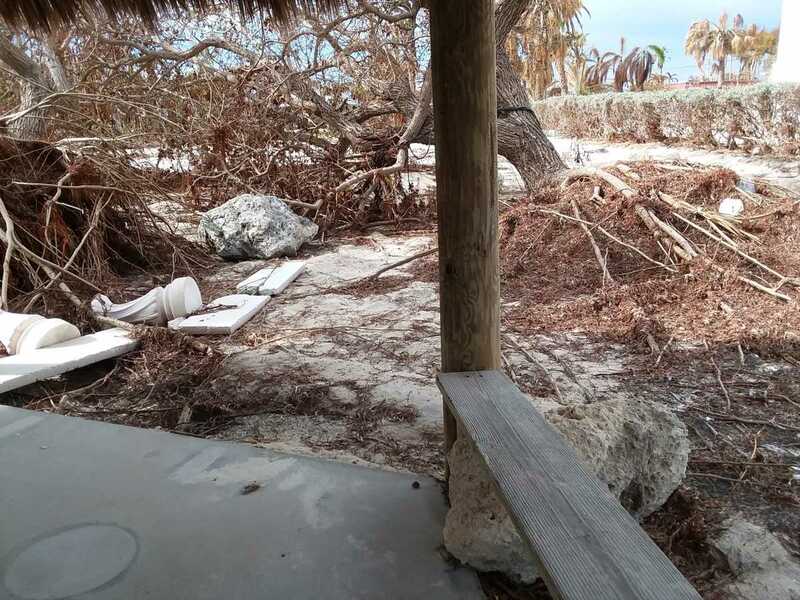 From City Administrator Chris Moonis: Unfortunately, for those who want to return to Key Colony Beach in the near future, Monroe County Health Director advised us today for health and safety reasons, the Middle and Lower Keys could be closed off for up to 30 days. Only emergency personnel, approved supply distribution companies (e.g. Home Depot, Publix, etc. ), and government authorized contractors will be allowed past the checkpoints. However, I do know the County EOC is having discussions with all key local government leaders to access the situation daily, trying to make a decision to SAFELY allow residents re-entry as soon as possible. Keys Energy Services, which covers the South end of Seven Mile Bridge to Key West, reports that about 16% of their clients now have service in parts of Key West, Stock Island and Key Haven. The Florida Keys Electric Coop, which services the rest of the Keys, has restored power to about 42% of its service area. The Florida Keys Aqueduct Authority reports it now has pressure down to Stock Island. Many homes and businesses are still not receiving water in the Upper and Middle Keys, though, mostly due to broken lines in people’s yards that were ripped up by fallen trees. Robyn Lefcourt reported that cell service was just restored in Marathon. South Puffin has limited cell service. A neighbor reported: “had 3 ft in house.” That’s five houses from mine. Key Colony Point got scoured. John Bartus: Returning residents will want to go ahead and stock up on needed supplies, drinking water, and non-perishable food in advance of the reopening of the Keys through Marathon. Water pressure has been good through Marathon, although it will vary based upon individual neighborhood conditions. Power continues to be restored, although service restoration will depend upon the conditions in neighborhoods and individual homes. Cell phone service has been restored, but is nowhere near full strength. Sewers are coming online. “Don’t you pull the main feed fuses when you leave?” Rufus asked. I don’t pull the mains. I cut all power in the sunroom — that powers the A/C, the sunroom, and the hut on a separate circuit from the house service but the main meter. I switch off selected breakers in the house. The frig and some lights are still on. I can feel the mold growing from here. We weathered the storm here and shortly after assessed the situation. Saw or neighbors belongings everywhere. Fast forward a couple days…there was a couple keys contracting trucks with equipment in the neighborhood allegedly to help out. But we noticed several items we had seen before on the ground in the back of their truck. When questioned, they were “collecting them to return them…” BULL CRAP….not to say anything derogatory about the company, maybe just some individuals. Just watch for wolves in sheep’s clothing. From City Administrator Chris Moonis: KCB is open for residents as of 9am TODAY. Please make sure you have paperwork showing residence or property ownership to be able to get through the checkpoint in Florida City. A hurricane entry sticker makes it a whole lot easier if you have one. All points south of the 7-mile bridge will open Sunday at 7AM. *All returning residents must be self-sufficient (including their own food, water and fuel to sustain themselves). You cannot rely on Electric to be operational nor obtaining food or water from distribution centers. *Many hazards still exit in the area. Use extreme caution once you arrive. If you do not absolutely need to come to KCB, consider waiting as long as you can. *A disaster recovery center will be opening at Marathon City Park in the future. *We encourage you to bring RVs, Motor homes, etc., to potentially live in (on your property). Your home may not be livable at this point. The Commission will work on a solution to the issue as soon as they can but I have instructed our Code Enforcement Officer to temporarily suspend enforcement of the RV/Motor home compliance. Please make sure any of these vehicles are on your property and out of the City right-of-way or City Streets. *Be prepared to need live elsewhere if your home condition makes it uninhabitable at the moment. There will be very limited accommodations elsewhere in the greater Marathon area and South. *A BOIL WATER Notice remains in effect and will continue until further instructed. *When you do receive Electric Service, the power may continue to be unstable as the system continues to be worked on. *Our Sewer Plant continues to function well, with some minor problems being addressed continually. We expect to be switched from generator to electric power sometime today. *Fisherman’s is still closed but trying to have a mobile hospital in place no later than Tuesday. The armed services set up a mobile hospital at the City of Marathon, City Hall. Building official Ed Borysiewicz rode out the storm at his house on 12th Street. Here he gives a video tour of the worst hit parts of KCB. Ed reported 4′ of surge on the centerline of his street. The same surge came onto the oceanfront with waves above that.
! @#$%^Comcast reports that service via fiber optic cable is active between Key Largo and Marathon. There are reported breaks in the cable between Marathon and Key West. Cable and Internet service is spotty and intermittent. I have no doubt that there have been absolutely no breaks or intermittent service in the billing department. People have started talking about refrigerator cleaning. It’s been more than a week. I figure the ooze of death is in the foam insulation by now. We took more than 15″ of water on the main floor. Joe got in just yesterday and said he is wading in mud. The stack of thick, white things beside the boat are ceiling insulation panels from the house that I had removed last year. I’m not sure if those are my saw horses out by the bougainvillea. I expect this will end up as a complete gut/mold abatement/rebuild. Joe’s boat was in the barn at Driftwood Marine on Coco Plum, the next rock over. It floated off the stands and is sitting on concrete and sounds OK. I started my flood insurance and windstorm insurance claims today. It is raining there right now and the power went out in some areas. Good news: Our favorite handyman/contractor is running a 10-man crew around the neighborhood. He’ll open the house up now to start airing it out and will have his crew start on it next week. I gotta figure out how to wire him moolah to meet his bill. Another neighbor will go up to get the paintings as soon as he gets the house open for her. On the other hand, Joe is working way too hard, sleeping in his trailer, and trying to do everything himself. The BOIL WATER NOTICE has been lifted for Key Colony Beach and most of the Keys. Some parts of Marathon are still under the notice. The Marathon Post Office is accepting packages to send out at their mobile unit in front of the main post office. UPS is still not up and running yet. State parks appear to be unmanned but may not be actually closed. No swimming though. The roadblocks are down so tourists are allowed in. 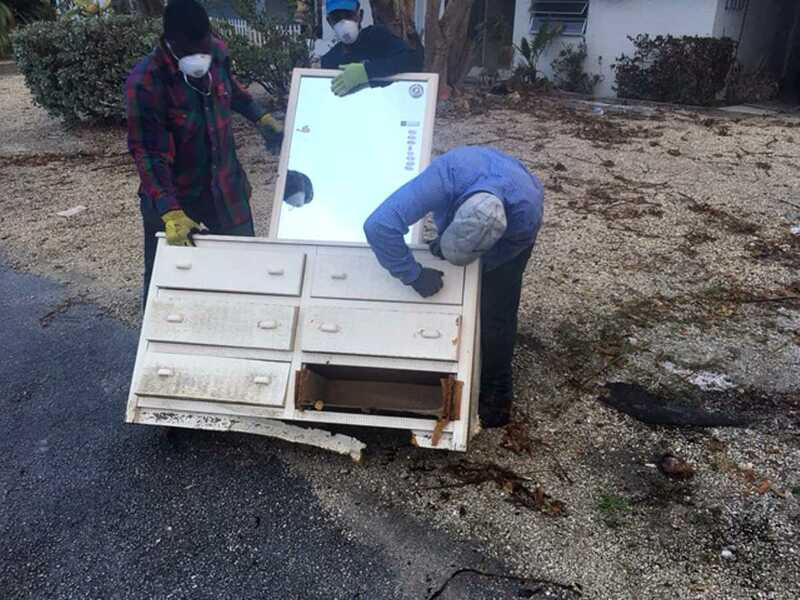 Over 1000 LDS volunteers came down from mainland Florida to help Keys residents. John Bartus: The Perpetual Island Tour resumes tonight (October 1) at Faro Blanco, 6:30 p.m. The response has been amazing. The Federal and state governments had resources ready. Our City officials have kept us informed while bringing the city back online in under a week. 22 states sent utility crews and countless volunteers. And, perhaps most important, everyone living in the Keys has pitched in to help their neighbors. There’s still a long way to go. At least half of the houses are damaged and probably 15% are commpletely destroyed but the stores and restaurants are already open so we can eat and poop and we have a place to lay our heads. This has been my longest column ever but it all means I’ll be mostly “off the grid” from now on. The No Puffin Perspective™ will be on hiatus until, probably, the first of the year. I’ll post updates when I can. Vermont has released the results for the “Smarter Balanced Assessment Consortium” test our students took during the 2016-2017 school year. This was the third year that Vermont students took part in the “Smarter Balanced” program. All Vermont public school students in grades three through eight plus grade 11 take the tests in English and math. The state reports the percentage of students who perform at or above grade level. Let’s look at what the state and some of the media tell us. The SBAC test results show that fourth graders in the Town of Franklin are doing great! 82.4% of them perform at or above grade level in math and 70.6% do the same in English. Everyone loves it when a percentage — sometimes a large percentage — of students perform at or above grade level. But wait. The reports help us lose track of the fact that a growing number of students are still found below grade level and only a scant few are doing better. • The Town of Highgate has generally the lowest numbers in the County; only 36.6% of fifth graders performed at or above grade level in English and only 19.5% did that in math. It gets worse in high school. At Missisquoi Valley Union High School, just 26.9% of eleventh graders performed at or above grade level in English and only 4.5% did it in math. • Student performance has also declined from the 2015-2016 school year but the reports don’t show that up front. School results like this are worrisome, particularly when the Agency of Education apparently can’t do the arithmetic. The reports help us lose track of the fact that a growing number of kids are still found below grade level. At MVUHS (simple arithmetic here) 95.5% of 11th graders scored below grade level in math! 95.5%. Even in the Town of Franklin, almost a third, 29.4%, scored below grade level in English. I’ve been thinking about schools and learning and creativity for decades. I have taught high school kids and college courses. I have studied teaching thanks to Vermont Colleges and “workshopped” in the hot ticket for teaching techniques (for the record, I prefer Mastery Learning). I have worked with school administrators and superintendents. And I was School Moderator for our Town. In real life, I’m an engineer so I live for data but, above all, I know the statistics hide the kids. The Bard remains a fixture in high school English classes so I asked 11th grader Jimmy Lombard what “wherefore” means in the phrase “Romeo, Romeo, wherefore art thou Romeo?” As an aside, the Washington Post posited that teachers should not assign Romeo and Juliet. Kids are supposed to “fluently” multiply and divide numbers up to 100 by the third grade. 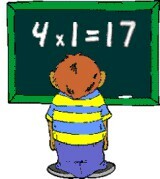 Many education experts today won’t even teach the multiplication tables. In another county, Burlington, Vermont’s teachers just settled a four-day strike. They wanted more money, of course, but mostly they wanted less time with the kids. A major disagreement in the contract negotiations was simple: the teachers demanded to be excused from interacting with the kids for 20 minutes during lunch and recess. The average Burlington teacher’s salary for the past school year was $70,878; the state average salary was $59,154. The average Burlington student performs below grade level. Imagine that. Professionals want more money and less time on the job to turn in poorer and poorer results. “Students Deserve Quality Teachers,” too. Is the glass half empty? My question remains, should we stop assigning Shakespear and multiplication tables because they are hard or should we buckle down and learn to teach Jimmy and Karen and all our other kids?